Power Girl has a nightmare about Kal-L's death in which he returns, and believes that the dream is premonition. Later, the JSA celebrate with the firefighters whose engine was destroyed in the recent battle with Vandal Savage. Outside, Wildcat 1 and 2 hold a fight for charity, and Citizen Steel comes to terms with his new family and the kids surrounding them, making pancakes. The bell rings, and the firefighters are assembled. The JSA goes with them to the scene, where a fire has trapped a group of firefighters. It appears that Goth, an old Titans villain, has been shot through the chest, and the ensuing demonic fire is destroying the building. Starman, realizing that no one else can combat the blaze, builds a black hole over the building after Power Girl, taking a leadership role, grants his request to do so. He manages to snuff the fire, but in the process loses consciousness. From the portal, the Kingdom Come Superman emerges, holding Starman in his arms, calling him by name, and asking where he is. Story - 4: It's hard to put my finger on what makes this story a little less satisfying than the others of late. There's a lot of good here. Power Girl's leadership role finally being acknowledged. Citizen Steel resolution. Kingdom Come Superman. All classic elements and great stories. ...seemed a bit stretched for me, and somewhat of a ploy. I love firefighters, Jesus, police, America, etcetera and etcetera, all the things you're supposed to say, but the honest truth for me is that firefighters as a symbolic nobility have been far too overused since 9-11. There are many professions that are quite noble that go ignored, mostly because they lack the risk of potential death, true, but my point is not to disparage firefighters, it's more that as a writer, it's like having someone hang out with Jesus and give the thumbs-up. It's a bit easy, because people relate to it a bit too much. Nonetheless, I dug seeing the JSA fly with the firefighters, I dug the concept that it led into the revelation of Superman, but all in all, it seemed a bit stretched. 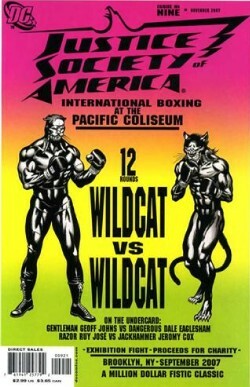 The Wildcat fight, the scenes with a lot of talking, it wasn't as character thick as it usually was. Get this, me dogging on a 4 of 5 that's really a pretty good issue, I know. Curse you, Geoff Johns, for being so good so constantly, that when I do have one little point of contention, I have to write so much to justify it! CURSE YOUR BONES! But seriously, it's not going to throw me off this book. It still has more subtexts in its little pinky than the whole of Countdown. Art - 5: If anything, I can see this issue as Geoff taking one for the team, because this issue gives Eaglesham full license to TEAR IT UP. And he does. The splashes, the action, it's all rather incredible. I really, really dig his work, and this book only raises him in my estimation. The two page spread, the fight with Wildcat, the fire, all incredible work. Cover Art - 3: You know, I'm a big Power Girl fan. It's hard to make her look ugly. I mean, if it's not the obvious asset, it's the fact that someone close to me dresses like Power Girl and blows my mind twice a year. At any rate, this image, while beautifully painted and great against the black backdrop, makes her looks like a over-muscled, kind of haggish truck driver. It hides (how else to put this?) the breasts, gives her overlarge biceps, and she looks arrogant, not confident. There is a difference, and the difference is that I'd love to be confronted by a confident woman, and the cocky one is the kind that would call me a misogynist for questioning a woman as opposed to women. It's hard to say the above without expecting hate mail, but it's honest. Power Girl is a very positive, beautiful role model for me vis-à-vis beautiful, strong women, and here she's kind of brutish and ugly looking, which takes from her for me. Does that mean I want her to have E breasts and be hanging out all over the place and look submissive? Don't read into what I said. But rather, it'd be like if Supes' cape was way too small and his pecs were huge and his eyes were glowing red like he wanted to murder someone. That kind of out of character-ness, if you will.